The Beach Boys in 1964. 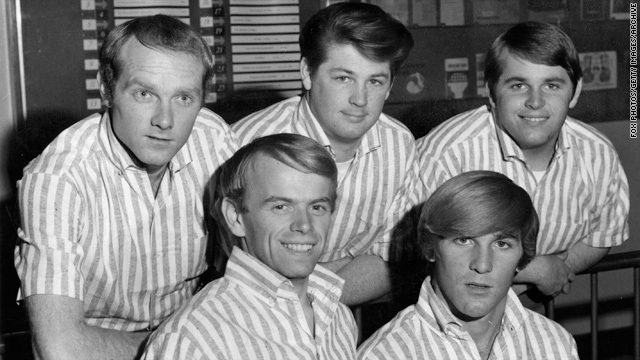 From left, Mike Love, Al Jardine, Brian Wilson, Dennis Wilson and Carl Wilson. Greene: "They are America's enduring soundtrack of summer"
Editor's note: CNN Contributor Bob Greene is a best-selling author whose most recent books are "Late Edition: A Love Story" and "When We Get to Surf City: A Journey Through America in Pursuit of Rock and Roll, Friendship, and Dreams." (CNN) -- The dirty and tattered piece of paper, with remnants of thick black industrial-strength tape still stuck to its edges, would not necessarily seem to be a harbinger of summer. "Catch a Wave." "Surfin' Safari." "California Girls." "Be True to Your School." "I Get Around." I had caught up with the Beach Boys in Fort Myers, Florida, on a Friday night this spring. They were scheduled to play at the Barbara B. Mann Performing Arts Hall. It will soon be half a century that they have been singing and touring. Fifty years since they really were little more than boys, writing and singing the songs of summer for the first time. Too much has happened to them since they first took to the stage wearing those identical striped shirts, nervous young men careful to bow to the audience after each song. Carl Wilson and Dennis Wilson are dead; the much-publicized acrimony in the band has meant that Brian Wilson, Mike Love and Al Jardine almost never share the same stage anymore. Not that anyone asked for my opinion, but here it is anyway: We all are given a finite number of heartbeats in this life. If I were those three guys, I'd find some way to put the old anger aside and play that wonderful music together again. Before it's too late. But this column isn't about the singers. It's about the songs they gave to the world. The songs have brought so much happiness to so many generations, for all these years. "Little Deuce Coupe" and "Shut Down" and "Surfer Girl" and "Surfin' U.S.A." -- they are America's enduring soundtrack of summer, they somehow never grow old, and there is a chance that, because of those songs, the Beach Boys may one day enter John Philip Sousa territory in the national memory, becoming a sustaining part of U.S. history. It's too soon for that, though; for now, there's a new summer of one-nighters stretching out ahead. Backstage in Fort Myers we ate a cafeteria-style dinner; I sat with Randell Kirsch, a Beach Boys guitarist with whom I spent 15 summers on the road while he and I were touring with Jan and Dean. He told me that at a television studio in California recently he had shared a similar commissary meal with astronaut Buzz Aldrin. "We talked about the moon, spirituality and surf music," Randell said. That is one of the many unlikely places that singing the songs of summer can take a person: to the side of a man who walked upon the surface of the moon. John Stamos, the actor, has gone on the road to sing with the Beach Boys whenever he can for the last 25 years; he was in Fort Myers on this night, and as we talked, Mike Love, the band's lead singer, came over with his own plate of food. I asked him if he thought there might be a band called the Beach Boys on the road even after all the original Beach Boys are gone. "I don't see why not," he said. "The music's not going to die, is it?" Well, as the song advises: "Don't Worry, Baby." Everything will turn out all right. The show started, the guitars sounded, the audience rose to cheer. The gloriously predictable set -- "Wouldn't It Be Nice," "Dance, Dance, Dance," "Sloop John B," "Good Vibrations" -- unfurled. For 105 minutes, the world seemed peaceful. As "Help Me, Rhonda" was ending, Stamos looked to where I was standing in the wings and motioned with his head for me to join him. He handed me his candy-apple-red Gibson ES-335, and we shared a microphone on "Barbara Ann," and I wish you who are reading these words could look out into a Beach Boys audience and see the upturned faces on the cusp of another summer, the people joyfully singing along with songs whose lyrics they know as well as they know the Pledge of Allegiance or the names of the presidents. Unhappiness, it seems, can against all odds be kept at bay. One-hundred-five minutes at a time. I stuck it into my pocket. A souvenir in advance of warm months that will soon be arriving. However many of those heartbeats we each are given, they seem to swell more gratefully when summer is on its way. Catch a wave and you're sitting on top of the world.